1.Cover your work area with old newspapers or a plastic tablecloth. 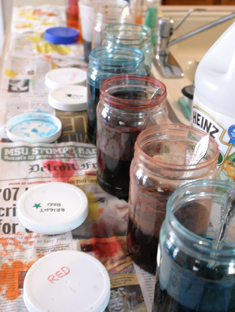 Have your cooled, room temperature dyes in jars on the work area. Place several sheets of paper towel at your work space. 2.Make sure there is adequate light. Sunlight is best, but, if it’s not readily available, a good lamp will suffice. 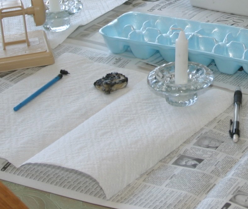 3.Have everything you need at hand: candle, matches, pencil, styluses, wax, design sheets, paper towels. 4.Make sure your work area is warm enough, at least 68-70 degrees Fahrenheit. If it is too cool, the wax may not stick to the eggs. Wash your eggs with warm water (room temperature) using I Ivory dish soap or other gentle soap. Scrub off any dirt with a Scotch-Brite or similar sponge. Pat the eggs dry gently, and let them dry off. It’s best to spread them out on a dish towel. Carefully inspect your eggs, discarding those with cracks, weak spots, irregular shapes, or too many bumps on the surface. Holding them to a bright light (“candling”) ensures you don’t miss any cracks or weak spots. Keep your room temperature eggs in a paper egg carton or resting on a clean surface while you work. Make sure they can’t roll away. Plan ahead. 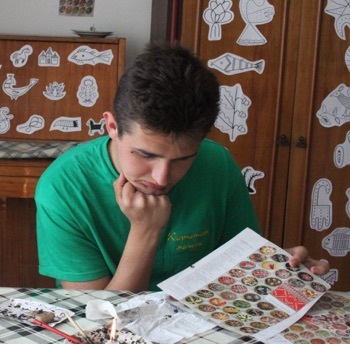 Choose a design from a book, or from pattern sheets. If creating your own pattern, sketch out a rough version on paper. Know in advance what sort of division you will need of the egg’s surface, and what colors you will be using. 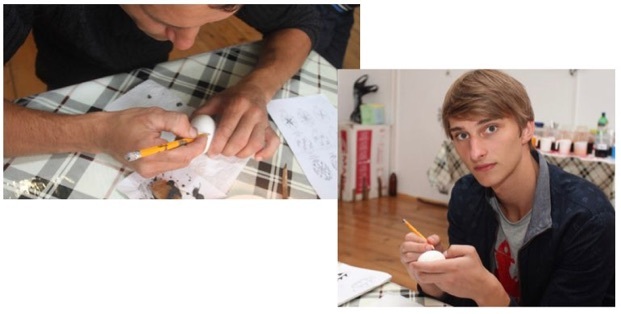 Proceed to draw the basic design on a clean, dry egg at room temperature. Draw on the egg lightly with the pencil. Use the pencil to draw basic divisions and lines; DO NOT draw on every single little detail!!! If you make a mistake with the pencil, DO NOT use the eraser on it. Remember, the pencil lines (if drawn on lightly) will not show up in the final design. They will usually be removed with the wax, so mistakes are OK. A bit of spit on a tissue can be good for removing small amounts of pencil lines; Goof Off wipes work well, too. You can download a previous .pdf version of parts 1 and 2 here. Please feel free to print it out and share it (e.g. classes). If you wish to reproduce this content in a publication, or on another web site, please ask. Note: All photos, illustrations and text © Luba Petrusha 2007. All Rights Reserved. Reproduction prohibited without expressed consent. May contact via e-mail (link below).